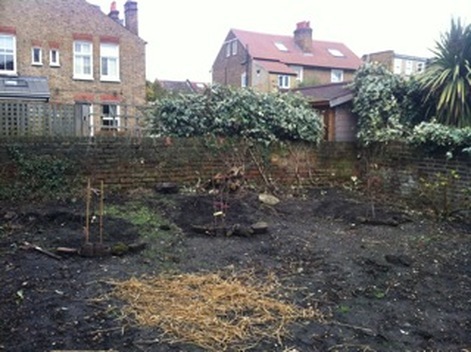 A new community garden has been set up in the Pelham Road area. Staff at the Polka Theatre will be maintaining the garden and plan to grow vegetables, fruit and salads. It's hoped that some of the produce will be used in the Polka Theatre cafeteria. The garden was set up with the help of Transition Town Wimbledon and Abundance Wimbledon has got the project off the ground by donating two of the fruit trees, with the garden owner supplying the third. Two 'Merton' varieties of apple tree were planted - Merton Worcester and Merton Russet - along with a Bramley cooking apple. This donation is in line with Abundance Wimbledon's aim to encourage growing and using of local fruit in Wimbledon. And finally, our thanks go to the generous owner of the garden for enabling others to benefit from an otherwise unused space in Wimbledon.